1 x Red Admiral, 2 x Meadow Brown, 2 x Speckled Wood. Those of you who have been watching this site for a couple of years will know exactly what I feel about this flower. 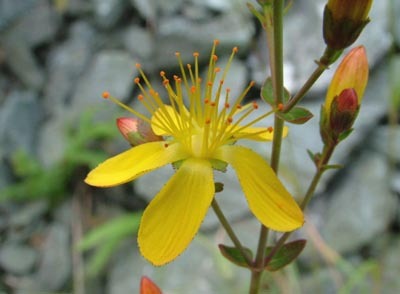 Slender St. John's Wort - Hypericum pulchrum. The Meadow Brown - Maniola jurtina - appeared this week. They should be quite obvious for for a couple of months. 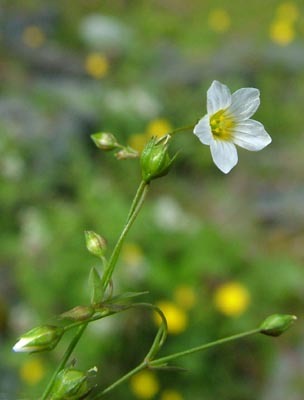 Fairy Flax - Linum catharticum - has to be one of the trickiest flowers to photograph. Each flower is only 3 mm across, and gives you very little to focus on. Its other name of 'Purging Flax' gives some clues about its purgative properties. These two shots of our first local Red Admiral - Vanessa atalanta - give no clues about what I had to to do to get the pictures. Suffice it to say that I'm still picking Thistle spikes and Gorse needles from my clothing and body parts. It's a very fresh specimen given the fact that it has flown thousands of miles to get here. My first Dragonfly image of the year; a female Common Darter - Sympetrum striolatum. 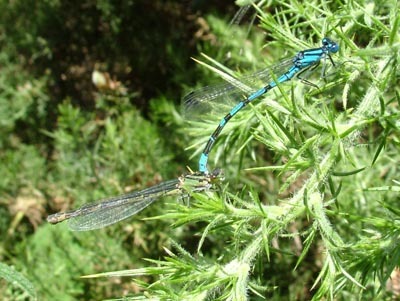 And lastly, a long-range shot of a male Blue-tailed Damselfly.